This Seal Puzzle is approximately 6 inches wide by 9 inches tall. All puzzles are cut from clear pine (3/4 inch stock). They are sanded smooth. In other words, these puzzles are safe. 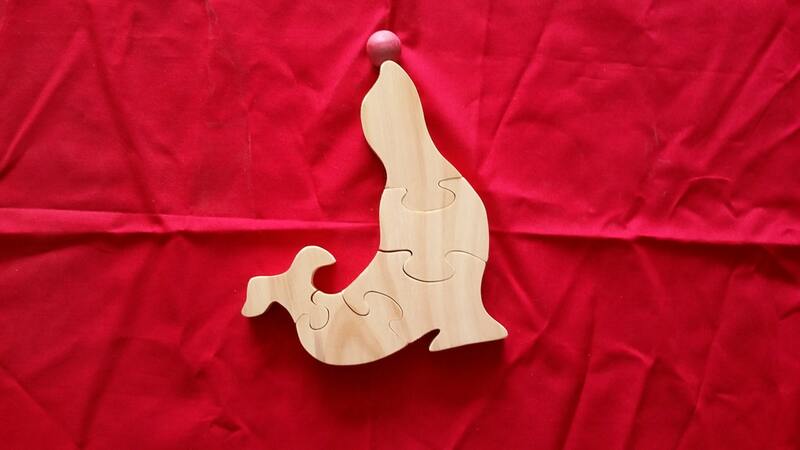 All puzzles are self-standing and have interlocking pieces. They are cut on a scroll saw which gives the pieces a very smooth look. Puzzles are fun and also aids and promotes manual dexterity! It provides a great alternative choice for those of us looking to give children a toy that is crafted in the U.S.A. from natural materials! It is built to withstand imaginative play with a lucky little girl or boy. The photos are taken with the puzzles standing and laying flat. Some puzzles have smaller pieces than others and some have more pieces than others. Puzzles are not recommended for children 3 years of age and under or for children who insist on putting everything in their mouths. Remember, if the object can pass through a paper towel roll, your child could swallow it! KNOW YOUR CHILD AND BUY ACCORDINGLY! NO PAYPAL ACCOUNT? QUICK/FREE REGISTRATION AT PAYPAL.COM. FREE USE FOR BUYERS! I asked for a custom kangaroo. My daughter's nickname is 'Roo'. He looked for a kangaroo and within 2 days he had found one and made a sample for me to see before purchasing. I am BEYOND pleased with the jigsaw. The work is amazing. He even gave me a bonus gift of 'Roo' in wood too. I highly recommend this seller. Amazing communication AND fast delivery.